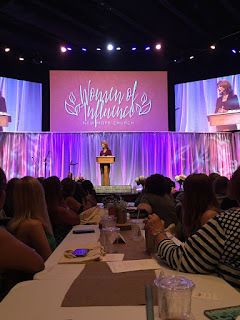 Faith, Coffee & Love : Are you a Woman of Influence? This past weekend I was fortunate to attend a Woman’s Event at my church, this year is was called “Woman of Influence”, and I feel as though it was the perfect title to the stage in life that I find myself in these days. Although truth be told, we are all in that stage in life no matter our age. During this event they had giveaways and if you won something you were encouraged to whoop and holler in excitement, a 92 year old women won something and she joined in and even gave a little dance. She dressed up in a purple flowery blouse with a purple hat and her joy of life was evident, later I glimpsed her with her walker which was also decked out. Her personality was vibrant and all I could think about was how she was influencing so many of us in that very moment. WOW! 92 years old and loving life! I struggle and have struggled as a mom so many times, I wonder if I’ve done anything right this whole time and if I will ever get the motherhood down or if by grace somehow I manage to be a woman of influence – mind you with the right kind of influence. I think back to my son when he was three years old and at the time he didn’t call me “mom” or “mommy” he called me “Yvonne”. As I started to go to church and change my life and my priorities, one day Chris got behind me in the crowd as we exited the church and just like that his voice cut through the crowd and he called out to me “Mommy!” The whole world stood still and my breath was caught. What a change in the influence my life was having on him. I was able to attend this event with a couple wonderful ladies I love very much and in the moment you realize the influence they have on your life. Momma Rachel (my best friends mom) and anyone else’s mom if you so need her to be or my daughters other grandmother in my case. Her influence has impacted my life for more than 15 years showing me her unconditional love. Connie from Momma of Dos, is a woman of influence in the blogging world leading and paving the way for so many bloggers that have followed her footsteps. In so many ways a woman of influence showing me that hard work and consistency pays off – follow your dreams and don’t let someone tell you it can’t be done or that (worse) it’s a waste of time. There is a good chance that she’ll take you up on that offer and show you otherwise. What kind of influence are you? Do you inspire, encourage and love? Maybe you are a teacher, protector and nurturer - I hope you are and I hope you realize that years from now you’ll step into the knowledge that you have inspired someone along the way.